When one thinks of the greatest city in the history of pulp fantasy, one immediately thinks of the City of the Black Toga, Lankhmar. 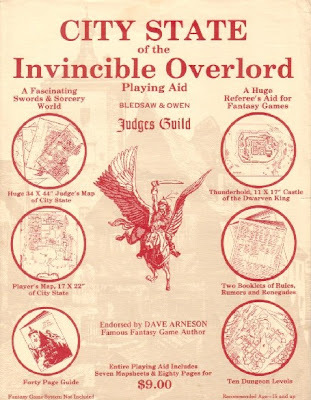 And when one thinks of the greatest city in the history of fantasy roleplaying, one immediately thinks of Judges Guild's City State of the Invincible Overlord. First published in 1977, CSIO made a huge splash at the time of its release and it remains, in my opinion, the gold standard for urban sourcebooks over 30 years later. One reason for that was its huge 34" x 44" map (in four sections), detailing over 300 individual locations, along the NPCs who inhabited them. This opened urban adventuring to sandbox-style play with great ease. Players could send their characters to wander aimlessly through the City State, checking out its various shops and sights without the referee having to worry about the daunting task of creating it all himself. Of course, in typical Judges Guild fashion, these details were sparse and open-ended. This let each referee tailor the City State to his own campaign, making this product very much a "playing aid," just as it bills itself. CSIO really was a very flexible and easy to use product. I have filed off the serial numbers and re-tooled it for use in many campaigns, most memorably my Greyhawk campaign of old, where it stood in for the City of Greyhawk itself (there being no official alternative at the time). The City State is also the basis for Adamas in my current Dwimmermount campaign. Oddly, I've never actually used it in a genuine Wilderlands campaign. My few Wilderlands campaigns were all set far away from the City State, which makes me a bit unusual, I suspect. I don't think it's an understatement to say that Judges Guild played a bigger part in establishing most of what I consider the essential elements of old school play than any company outside of TSR. Beyond that I'd say that JG did even more than TSR when it came to developing certain elements, most notably wilderness/sandbox and urban play. CSIO shaped many people's perceptions of what a D&D city ought to be and, as I said, I've yet to see a more immediately useful urban environment for gaming than this one. Like the Wilderlands of which it's a part, the City State is a terrific pulp fantasy goulash that borrows gleefully from many sources of inspiration, creating a city that's not only a great place to adventure in its own right but one that feels as like a D&D city should -- boisterous, somewhat incoherent, but brimming with possibilities. You can still find copies of this great game aid on eBay and from used game sellers, but they're often very pricey. Necromancer Games produced a 3e version of it several years ago and, like all their JG stuff, it's excellent. It really is a pity that they're not continuing to produce new Wilderlands material, but that leaves an opening for guys like James Mishler, so I can't really complain. In any event, City State of the Invincible Overlord remains one of my favorite RPG products of all time and, in terms of its influence, it certainly ranks highly indeed. No doubt about it: one of the greatest playing aids ever produced. I can't guess how many of the "cities" in my campaign world were actually just random parts of the City-State (though it always irked me just a bit that people seemed to have more fun there than in anything I drew up!). I still have my copyright '76 "Guide to the City State" (sans maps, alas) as well as the full '78 revised edition -- both a bit the worse for the years, but still essentially intact and quite usable. What are your thoughts on Chaosium's Thieves' World boxed set? First published in 1977, CSIO made a huge splash at the time of its release and it remains, in my opinion, the gold standard for urban sourcebooks over 30 years later. In my opinion, the ultimate in gaming. My 20+ year campaign was centered on CSIO, and romped through the Wilderlands. Nothing will ever replace it for me. I did also enjoy Thieves World, and Glantri, altho neither captured my players' fevered imagination like CSIO did. Beyond that I'd say that JG did even more than TSR when it came to developing certain elements, most notably wilderness/sandbox and urban play. I think JG also published some of the closest examples of big campaign-sized dungeons of the sort that the original D&D books described: Caverns of Thracia and Tegel Manor both approach this kind of thing. Unfortunately CSOIO never made it to my neck of the woods back in the day (Texas had notoriously spotty Judges Guild distribution, and offerings were slim when I was just starting out) and I had to wait until the early 90s to finally own a copy. We did however have the inferior City State of the World Emperor which I stole from liberally to create my own city. It's ironic that TSR themselves didn't come out with their first "city" type product (City of Greyhawk) until 1989. Judges Guild (CSOIO, CSOWE, Tarantis), Midkemia (Carse, Tulan), Gamelords (Haven), and Chaosium (Thieves Guild's Sanctuary)had all already released far superior products, of which CSOIO was the best. I only wish I had been able to find a copy back in the glory days of our adveturing group! It's absolutely the most old school of the bunch and a setting to remember. I have the Necromancer hardback and have struggled with it a bit. The map is rather small and I find it difficult to use; it has that World of Darkness style art that blights (IMO) many Nec products, and the book itself is rather unwieldy, mostly because it incorporates Wraith Overlord with those immense 3e stat blocks. My gut feeling is that it was designed more to look impressive than for maximum utility in play. Yeah, CSIO was -- and is -- a pretty cool product. Fortunately it's still available as a .pdf at places like Rpgnow.com for 6 bucks. At our table it was eventually muscled out by TSR's Lankhmar, but for it's time it was an outstanding product. Hell, if you play one of the older editions of D&D, it still is -- it's as useful now as it was 30 years ago. I think that's pretty much the definition of 'a classic' in this crazy hobby of ours. S'mon, I recommend that you take a look at rpgnow.com -- all the maps of CSIO are available for a couple of bucks a piece, so you could have 'em supersized at a local copyshop. The Necro ed is a bit wordy because of the huge stat blocks, but at least you needn't suffer because the maps are too small. Pricewise CSIO is still the best bang for the buck. Also Viridstan: City-State of the World Emperor was even more packed. The only downside was having to key it yourself but to some that was an advantage. CSIO and CSWE are killer. I actually got the most use out of the Free City of Haven of any city product, used in conjunction with Midkemia's Cities for additional encounter ideas. But CSIO and CSWE are also fantastic. VJ - since Nec have their CSIO map online I'm thinking about printing that out in sections myself. I'm not sure if that includes the maps. I don't think it's an understatement to say that Judges Guild played a bigger part in establishing most of what I consider the essential elements of old school play than any company outside of TSR. Beyond that I'd say that JG did even more than TSR when it came to developing certain elements, most notably wilderness/sandbox and urban play. Amen to this. CSIO is AD&D to me,in many ways: full of humans, demihuman races, bars where trolls drink and get into fights, the Overlord's not-so-secret police, the sewers and tunnels underneath the city itself, evil temples, and far, far more. Magic items abound as do spellcasters, and danger waits around every corner. I generally like full descriptions and details in my purchased supplements, but CSIO would be worse for that kind of weight. It's the perfect combination of specific and evocative, and I don't think it's been surpassed since. CSWE made the judge work a LOT more, since none of the sites were determined on the map. The Necro Games version had a tiny map, those frustrating stat blocks, and the hardback binding made it harder to use the guide. CSIO is, hands down, my favorite non-module supplement - and frankly, I find it far more inspirational and useful than most modules. Back in the day, we spent many a session simply winging it for hours based on random encounters, rumors, and off-the-cuff play. Gah! Now I want to grab some players and start an urban adventure based in the CSIO! Believe it or not, I never owned it. Ptolus is, by most accounts, very nifty, but it's also way too detailed for my purposes. Good points all. The Necromancer version is no replacement for the JG original, but it was all that was available at the time of its release. Now, there are PDFs, so it's probably better to snag those. I never owned Viridistan. I should probably correct that oversight soon. I keep running across mint copies of this for reasonable prices, but have yet to succumb to my great temptation to buy it. Do you recommend it? I loved the CSIO maps--they were an inspiration--but I never cared for the city itself. It was the very antithesis of "Gygaxian Naturalism." There was little rhyme or reason applied to how the maps were keyed--I suspect the authors applied a set of particularly mad random tables. You'd find a "belt shop" (operated by an 8th level wizard) next to an "iron spike store" (owned by a naga) next to a bawdy house operated by a storm giant. Sadly, I'm not really exaggerating. mishmash of gods randomly plucked from Supplement IV. Then there are the embarrassing tables for generating breast, waist and hip size for females . . . I loved the CSIO maps--they were an inspiration--but I never cared for the city itself. It was the very antithesis of "Gygaxian Naturalism." There was little rhyme or reason applied to how the maps were keyed--I suspect the authors applied a set of particularly mad random tables. You'd find a "belt shop" (operated by an 8th level wizard) next to an "iron spike store" (owned by a naga) next to a bawdy house operated by a storm giant. Sadly, I'm not really exaggerating. This is absolutely true and it's one of the reasons why I've always heavily modified the City State when I used it in play. Still, some of that random goulash sparked some great ideas. I hope I can be forgiven for not having mentioned that. James: I highly recommend Haven. It's my second favorite RPG city -- behind CSIO. Haven is a much different and far more detailed product, however. I loved the CSIO maps--they were an inspiration--but I never cared for the city itself. It was the very antithesis of "Gygaxian Naturalism." There was little rhyme or reason applied to how the maps were keyed--I suspect the authors applied a set of particularly mad random tables. ... Sadly, I'm not really exaggerating. mishmash of gods randomly plucked from Supplement IV. To me, this is really the charm of the City State. Not everything has to be Gygaxian naturalism; I appreciate a modicum of that, but there is also something to be said about Bledsawian surrealism - which works by taking ordinary concepts and taking them a few steps in an "off" direction through free association (or the creative use of random tables - Matt Finch's City encounters is a superb resource for this purpose). The results are not naturalistic at all; but they are legitimately strange and fantastic, and even have a disorderly realism of a sort to them. but the city map lacks the architectural chaos and organic character of the first city state. Too neat, too planned, and not wahoo enough. The last handdrawn map that I was working on was a redraw of Viridstan. One of the things I was trying to do make the city feel more organic. Alas it was never finished. Should scan what I got in so I can eventually finish it up on the computer. Also should revise my version of CSIO now that I improved my ability to create color maps especially in the area of being able to incorporate subtle shading. Something I love about the CSIO is the "aligments" as "political factions" or "parties". I have never seen this kind of use of aligment anywhere else. Here's an interesting post from the Wilderlands section of the Necromancer Games forum. It discusses the literary influences on the CSIO (and Wilderlands in general). Lankhmar is the model for CSIO. Lankhmar is the model for CSIO. I can believe it. The very name "overlord" for the city's ruler has a Lankhmar pedigree.